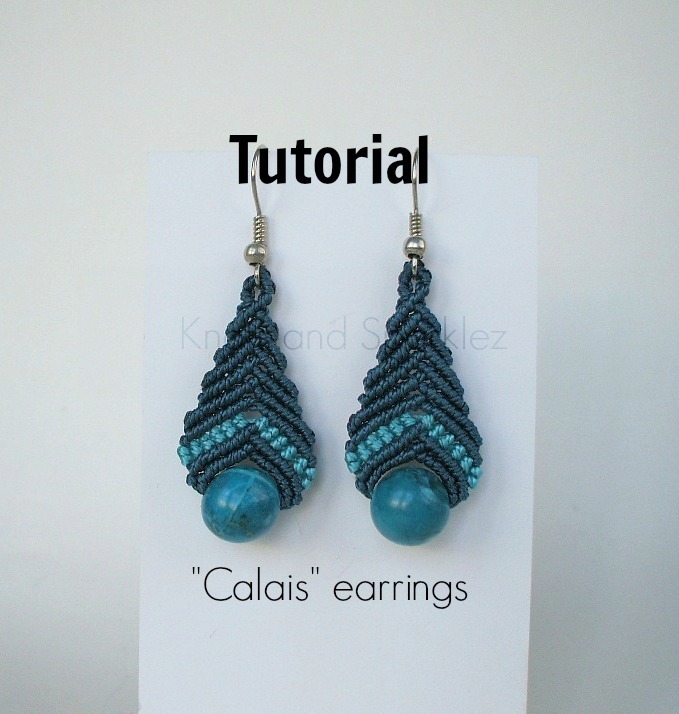 A fun project for a rainy afternoon, this earring tutorial is very versatile, once you master it you will be able to create variations of it, and maybe even make a pin for your favorite scarf! Think colors and beads variations. There are tons of pictures and instructions, materials and tools list and graphic help. This sweet bracelet is very feminine and pretty in plum and pink tones it will complements lots of outfits, as it is one of the most popular colors along with blue. At the end of the tutorial you can also view a light blue sample. Of course you can create your own color palette, as long as you keep the beads and cords sizes the same it will work out beautifully. This tutorial can be attempted by beginners as long as they have a basic knowledge of common macrame knots, as the knots required are most often used in macramé jewelry. A tutorial for a micro macrame chunky ring with center bead. I used a dyed Jasper stone but you can use any bead you like. 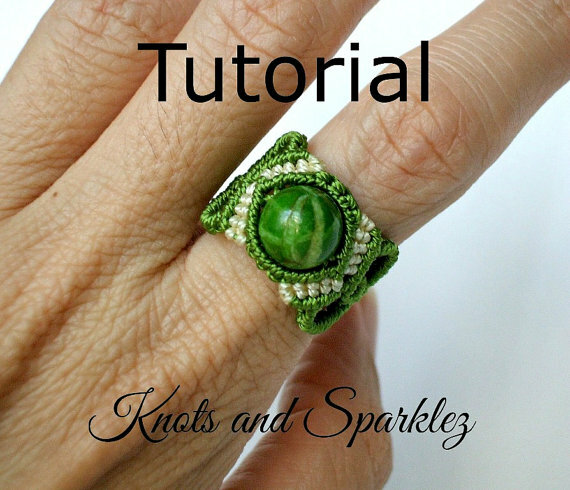 While completing this tutorial you not only learn how to make the ring but many other useful tips and techniques. You can than apply them to your own ideas. A little Bohemian, a little Hippie or Gypsy style, but I guarantee you that you will be admired once you wear them, even more so when you tell them you made them yourself. This is a pair of simply beautiful and light weight earrings that you can make in one GO, a few hours at the most if you are new to Macrame knotting. You might attempt even if you have never done Macrame before, but a little practice with your knots will go a long way. These require very little materials, and they can be done with a variety of beads and cords colors that suit your needs. You are not restricted to these colors, just make sure your cords are the size I specify and that they fit into your beads holes. Two cords must fit into your beads. This is a very easy bracelet that even beginners macramé crafters and those attempting Macrame for the first time can successfully complete. It looks classy, and easy to wear, so it will be a hit either you make it for a friend’s gift, or you want to wear it yourself. The necessary materials are very easy to find and very few. It is a quick project you can start and finish in one go, and you will have a great piece you can wear every day, I GUARANTEE you will be complimented on it, especially when you tell them you made it yourself. 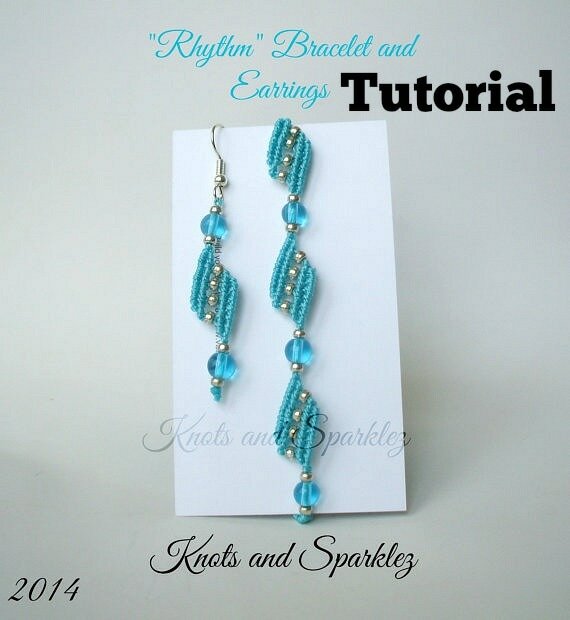 This is my Newest Tutorial and it includes instructions for the bracelet pictured here and for the matching earrings. Although there is no picture here for the earrings, there will be more once you click the link to my store. This Tutorial is suited for everyone, even beginners as long as they have a basic knowledge of macrame, like knots names, and how to tie them properly. Although there are plenty self explanatory pictures that you can follow to learn the knots, this tutorial is not to teach you about basic macrame, rather to show you how to craft the set. Materials list is included, and some useful links. 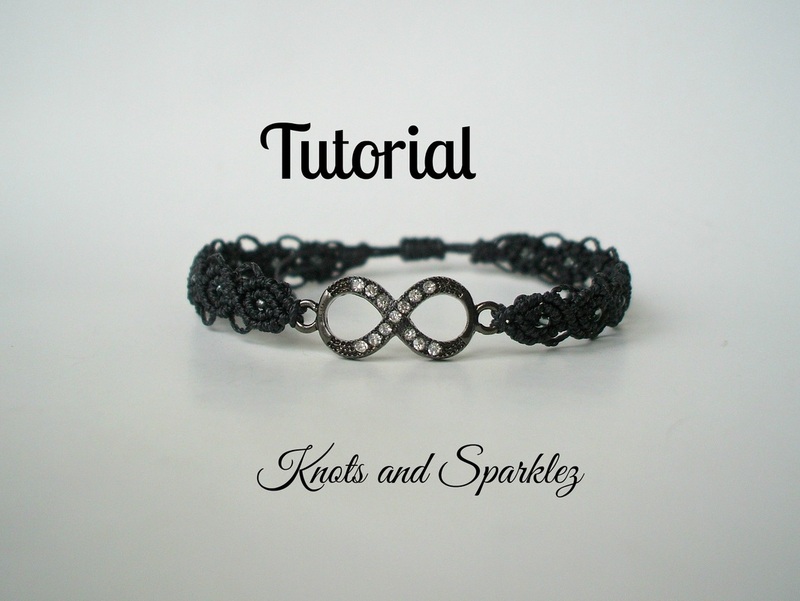 This is one of the latest TUTORIALS using a pattern I created for my many charms bracelet. This endless wave pattern is well suited for any charm as long as you can attach cords on both ends. It is pretty, elegant, and feminine yet it can be used for an everyday bracelet. The tutorial includes over 40 pictures with detailed instructions from start to finish, includes materials list and specifies amounts. It contains links to refresh your memory on Macrame knots as well. TUTORIAL - Macrame and Chain Bracelet. 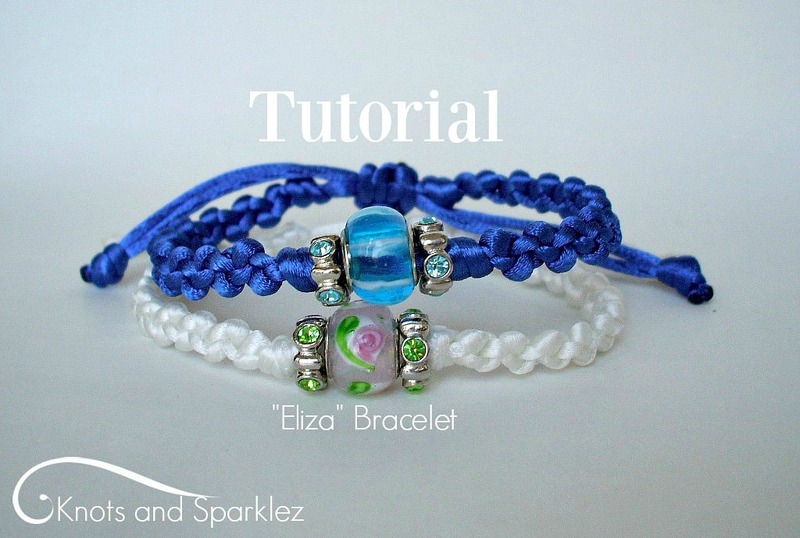 With this Tutorial you can craft either of the 2 bracelets you see in the picture. 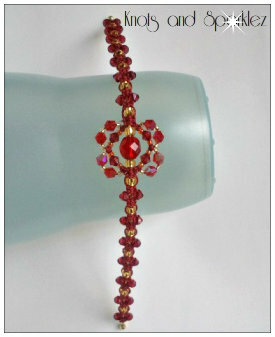 Tutorial is based on the Red Version, but instructions are included for the modified teal/gold bracelet. 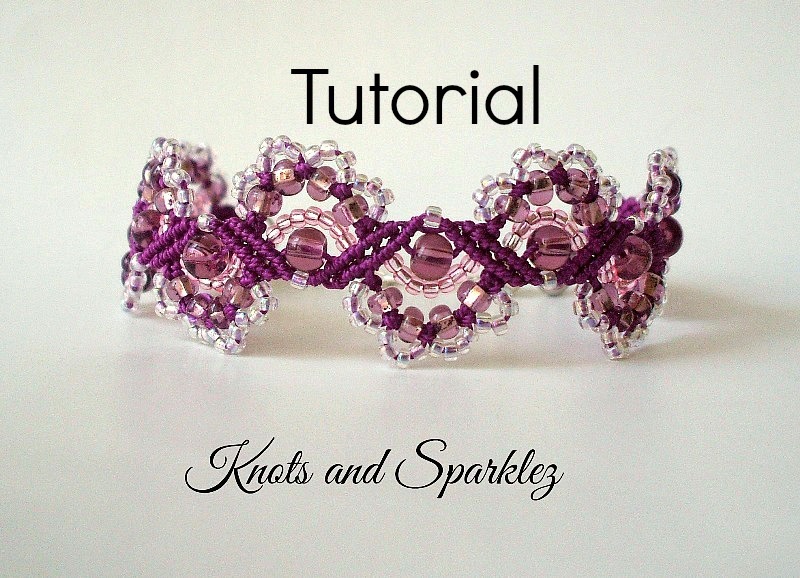 It is an easy level tutorial, but previous knowledge of basic macrame knots is required. There are links to direct you to detailed instructions for proper knots execution if needed. You can learn to craft this lovely and sparkly macrame bangle bracelet with this Tutorial which is suited for beginners as well, as long as they have a basic knowledge of macrame knots. Not to worry in the PDF file I placed links for you to visit in case you need to refresh your memory. You will need some memory wire, or like in my case some wire that you can easily shape into a circular form and basic macrame supplies. Everything is listed in details. There are about 29 pics, and very detailed step by step instructions to take you through it. The finished bracelet is about 8 inches long. This Tutorial teaches you how to craft the pretty bracelet in the picture, which I called Daisy Bracelet. I have designed and hand knotted it myself. It is a cuff bracelet so the type of cord used is important, soft cords would not have the necessary stiffness. It is suited for individuals with some knowledge in executing certain macrame knots, like Double Half Hitch and Square Knot. This tutorial is FREE, no need to purchase. It is in PDF format and easy to view. It is for your personal use only, you may even sell the bracelets you make, just please give credit to Knots and Sparklez for the design. However you may not mass reproduce or resell without permission. You may repost on blogs or other macrame website for others to try. Should the link on the site not work please contact me and I will email you the PDF file myself. Contact info is on the Home page. You can leave a comment on the Contact Us page as well. NOTE: to view the PDF file please click on the picture, it will open the file. When you hover over the text or the picture in that file you will see at the bottom of your screen the options to print or save the file. 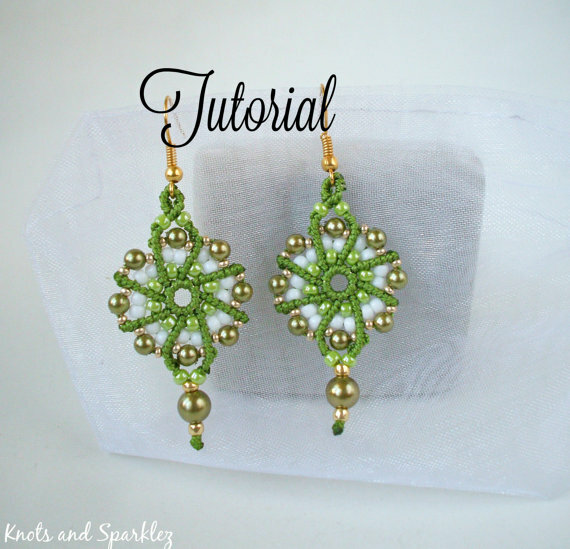 FREE TUTORIAL - Macrame Earrings with Crystals. This tutorial is suited for beginners as long as they have some prior knowledge and know how to properly execute BASIC macrame knots. Complete list of materials and tools is provided, detailed step by step instructions, 20 plus pictures, and useful links if you need to refresh your mind on how to tie macrame knots. It is pretty quick and it can be done in one afternoon.